Peter Sagan. That’s about it really, isn’t it? He’s won the points competition (here’s what that is) in each of the last five years and it’s hard to see anyone beating him. However, working on the premise that you never know when a broken collarbone might strike, here are a few other names to watch out for. Mark Cavendish, the man who’s won more Tour de France stages than anyone other than Eddy Merckx, warrants a mention. Sadly he’s had glandular fever this year and you don’t need to be a medical practitioner or an endurance cyclist to work out that an illness that makes you really really tired doesn’t make for the best preparation for a three-week bike race. Expect Cav to show his face for the sprint-heavy first week before quietly slinking off to recover. Marcel Kittel is supposedly Cav’s biggest sprint rival, even if the two of them don’t actually seem to go up against each other all that often. Kittel tends to win grand tour stages early on before fading once he’s had to haul all his muscles up a bunch of mountain passes. Andre Greipel will surely win a stage at some point, because he always does, while yet another German, John Degenkolb, will hope to win on days when the very fastest sprinters can’t quite stay with the bunch over the climbs. Alexander Kristoff – who you suspect would campaign for 400km stages if that were floated as a possibility – will look to take victories when others start to tire later in the race. 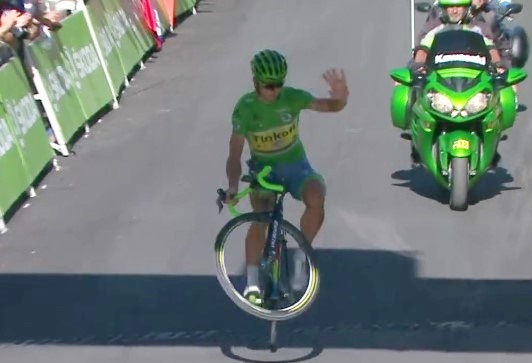 Finally, Michael Matthews is kind of like Peter Sagan, only less so.